Whenever Apple launches the next generation iPhone, fans all over the world go crazy wanting to buy one. And the story is no different in India. Now that the iPhone 5S is launched, Apple ‘fanboys’ in India are desperate to buy one. So much so, you can buy an iPhone 5S in India in the grey market for anything between ₹ 60,000 to 1,70,000 ($963 - $2730) for a 16GB model and that too without a bill and a device that will have no warranty whatsoever. However, that has not been something that the masses are concerned about. It’s the direct price comparison with the US market that makes them scratch their head. To put an end to all the confusion, I've decided to take it upon myself to clear all the doubts. First and foremost, Apple caters to the premium market. In layman terms, if you want an iPhone in India, you have to pay premium prices. Each and every person (anywhere in the world) pays a premium price for an iPhone. If that’s the case, why do US customers pay only $200 for their phone while we pay over $800 for the same model? Well, iPhones are sold on 2 year contract basis in USA. This means, their phones work only with the carriers that they opt for. Those phones cannot be used anywhere else in the world unless carriers have tie-ups with other carriers around the world. If users in America wish to buy phones that are not bound by any contract and can use any carrier that they wish to, they must opt for unlocked iPhones that are sold for $649 to $849 (₹ 40,000 – ₹ 52,000) plus taxes that vary according to a state/zip code. 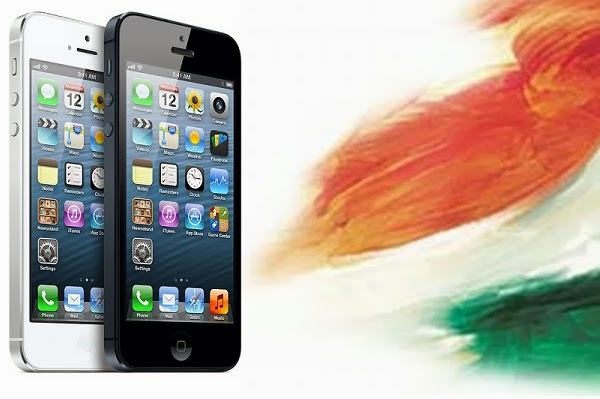 Why does an unlocked iPhone cost much lesser than an unlocked iPhone in India? The simple answer – Taxes. So here is how it works – In order to bring a sealed box to India, you must pay a custom duty (which stands at 6% for a mobile phone) that is a percentage of the price indicated on the invoice/bill of the purchased item. Further, you also have to pay for shipping charges, broker fees, CESS and a service tax in order to import an item successfully. So in order to import an iPhone, you have to pay all of the taxes mentioned above and that is what makes an iPhone expensive in India as compared to USA. Moreover, you must keep in mind that even if you are able to sneak an iPhone into the country, you will not be able to avail any warranty as Apple products do not have international warranty. It is rumoured that the iPhone 5S in India will be launched on 20th October and the 16GB model would be priced at ₹ 52,000 while the iPhone 5C which is seen as a replacement of the current generation iPhone will cost around 44,500 i.e. the current price of an iPhone 5. It is now confirmed that Apple will launch the iPhone 5S and 5C in India in its second wave of international launches, i.e. on 1st November. As far as pricing is concerned, the above article holds true not only for the iPhone 5S, but also for past and future iPhone prices in India. One can only sit and rant about how expensive an iPhone is in India. iphone 5C what a disaster. could have continued iphone 5 on the price of 4S and discontinued 4S. It would have been nicer on Apple's part if it was priced a little lower. Considering it has the same internals of an iPhone 5, I wouldn't call it a complete disaster to be honest.